Makers, developers and hobbyists that enjoy building projects using the awesome Raspberry Pi mini PC might be interested in this fantastic Raspberry Pi Gameboy which has been created by Travis Brown. Travis has taken an old Gameboy and replace the internal workings with a Raspberry Pi mini PC to create an awesome portable retro gaming handheld console. Watch the video after the jump to see this cool Gameboy project in action. The Pi-Pocket as it has been named by Travis is capable of playing Gameboy, NES, Sega Master System, Game Gear games. As well as popular ported Linux games such as Doom and Duke Nukem, thanks to the popular Raspberry Pi emulator, RetroPie. 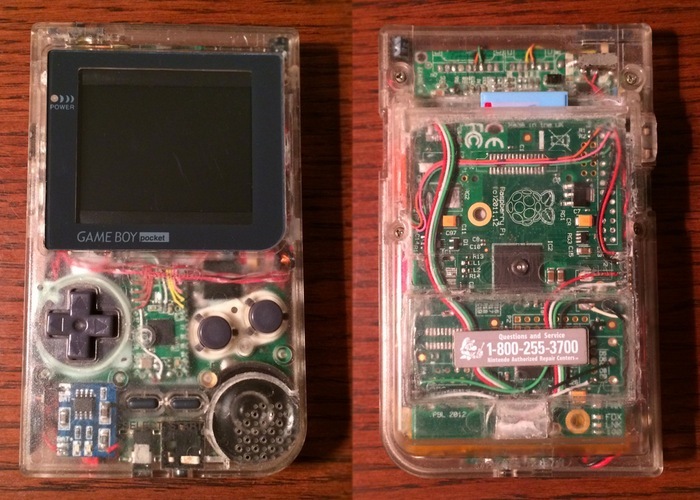 “The entire project fits into the shell from an original Gameboy Pocket mostly unmodified on the exterior. With all new internals the Pi-Pocket is fitted with a Raspberry Pi Model B, Li-Ion rechargeable battery, Color LCD, and a Mini Audio Amplifier. For more information on the new Raspberry Pi Gameboy device and full instructions on how to make your very own jump over to Travis’s website Xodustech for full details and components. For more details on Raspberry Pi displays and HATS jump over to our essential guide.